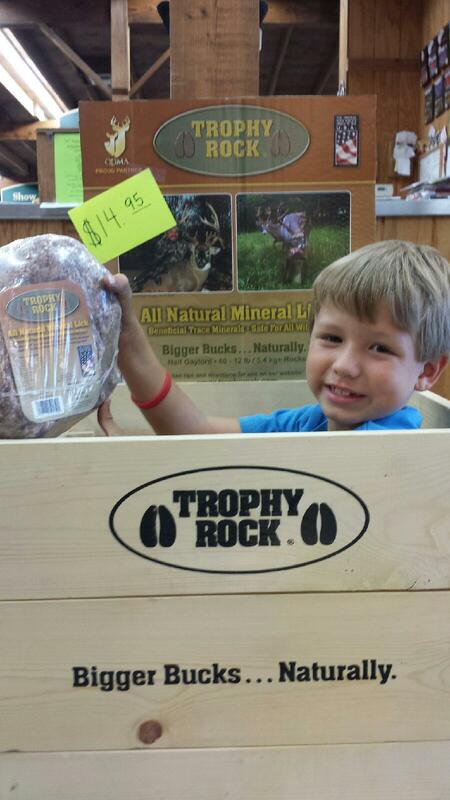 Trophy Rock is an all-natural mineral lick containing more than 60 beneficial trace minerals that grow bigger antlers, healthier deer, and successful hunts. Trace minerals are essential for animals to reach their development potential, and this product has 60 naturally occurring trace minerals. Keep Trophy Rock available during the early spring and summer months, and your herd can get a huge benefit. Healthier deer herds yield more trophy bucks, and Trophy Rock can improve your herd’s digestion, lactation, cellular function, and bone and antler development. Our dedicated fans will tell you there is no tool more effective at attracting, surveying, and holding deer on your property. Keep the bucks at your place! Try this product for yourself and see what countless others have seen – it just plain works. Come by Lochte Feed for all your deer feed, deer corn and deer minerals. This entry was posted on Tuesday, July 25th, 2017 at 3:06 pm	and is filed under News & Updates. You can follow any responses to this entry through the RSS 2.0 feed. Both comments and pings are currently closed.